Deliver a WOW, elegant card that wishes the Happiest of Birthdays! If you are like me, even when using the Clear Mount stamps, you can be challenged in placing the sentiment exactly where you want! 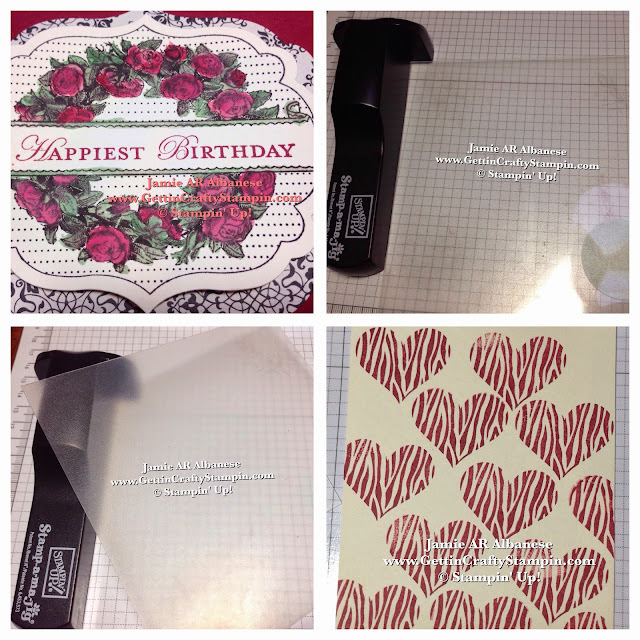 See this cool Video Tutorial on our Technique Thursdays for the perfect technique for image placement in rubber stamping and card making! Then, go ahead, create a stunning card that is sure to deliver a delightful wish - with the sentiment or image exactly where you wanted it to be! Stamping this stunning Apothecary Art label in Early Espresso ink on the Very Vanilla card stock. 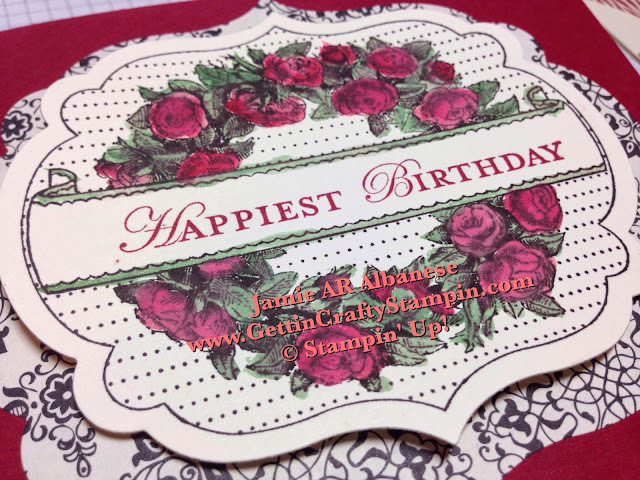 Now, to stamp this 'Happiest of Birthdays' sentiment in Cherry Cobbler ink is a struggle for me. 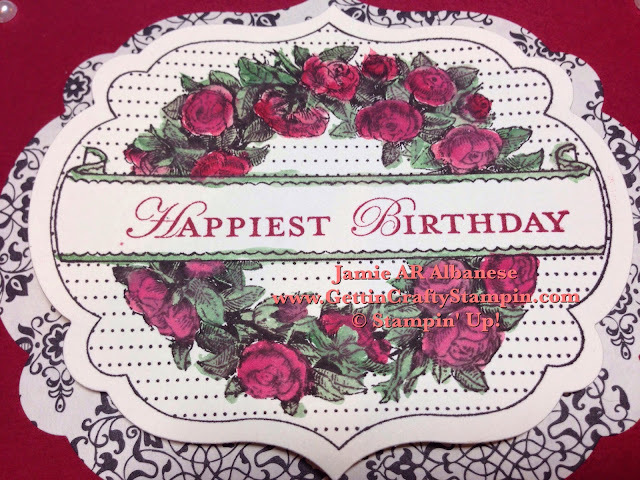 Placement, perfect placement is a challenge, even when using the Clear Mounted Stamps! I can't help but love and use the Stamp-A-Majig! See this tutorial on using this very cool tool for this cool looking hand-stamped card with a perfectly placed sentiment! Water color the flowers and leaves on this Apothecary Accent Label using the ink pads squished for a palate of ink on the lid. The Aqua Painters will create an elegant and softened look to this stamped image with rich colors! The perfectly coordinated Labels Framelits, Big Shot Die-Cutting Machine and Magnetic Platform allow for easy and precision cutting out of this stamped image. Layer with the next level up in the Framelits using this stunning Typeset Specialty Designer Series Paper! Oh how I LOVE my Big Shot!! Layer and add dimension to the labels with the Stampin' Dimensional adhesive. Buy your Big Shot Die-Cutting Machine, during AUGUST and receive a BONUS $55 in FREE Bundle + Exclusive Video Tutorials emailed from ME AND Free Admittance to the Big Shot Highlight Crafternoon Class!! WOW!! See MORE HERE!! Use THIS (URF72DA6 ) Hostess Code, at check out, and receive a BONUS Gift from ME!! It's the coolest of tools! I love that it gives me more control of my projects... and if you are an 'A' type - you will LOVE, love, love the Stamp-A-Ma-Jig! Pretty Papers, Stunning Stamps, Color, Dimension... WOW! I love how this elegant, easy and wow card came together! 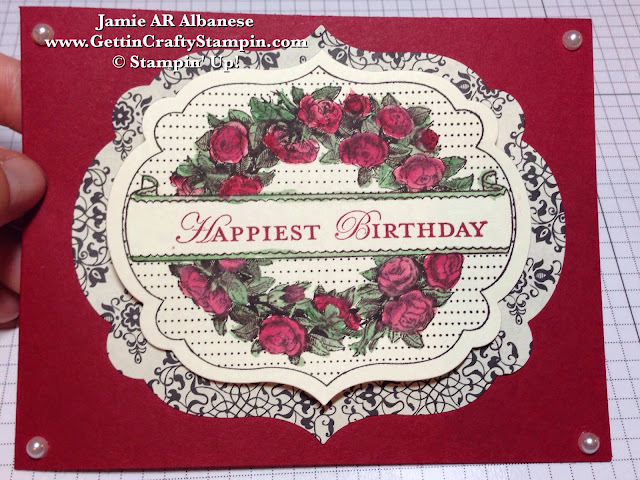 I hope that you enjoyed this Video Tutorial for extra wow on this hand-stamped card. Send a perfectly placed, elegant hand-stamped card and delight those who receive it. I love that these cards will live on and one while gifts and flowers will fade away.